"My First Coup d'Etat charts the coming of age of John Dramani Mahama (the former President of Ghana) during the dismal post-independence 'lost decades' of Africa. He was seven years old when rumors of that first coup reached his boarding school in Accra. His father was suddenly missing. 'It is sometimes incorrectly referred to in texts as a bloodless coup, yet it was anything but,' Mahama writes. 'They tried, as best they could, with smiles and toffee, to shield me from their rising anxiety but I could feel it bouncing off the quick sideways glances they shot one another and taking flight like some dark, winged creature.' John's father, a Minister of State, was in prison for more than a year. 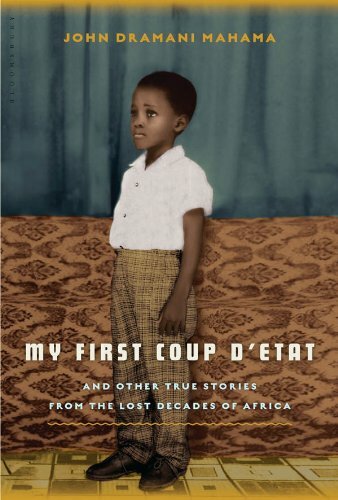 My First Coup d'Etat offers a look at the country that has long been considered Africa's success story—from its founding as the first sub-Saharan nation to gain independence, to its current status as the only nation on the continent to have, thus far, met the majority of targets on hunger, poverty, and education set by the U.N. But these stories work on many levels—as fables, as history, as cultural and political analysis, and of course as the memoir of a young man who, unbeknownst to him or anyone else, was destined to become a leader in his own land. These are stories that rise above their specific settings and transport the reader—much like the stories of Isaac Bashevis Singer and Nadine Gordimer—into a world all their own, one which straddles a time lost and explores the universal human emotions of love, fear, faith, despair, loss, longing, and hope despite all else."